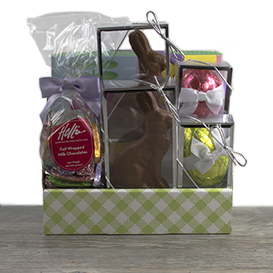 Filled with two pounds of chocolate Easter treats, this shareable basket is sure to make everybunny happy! 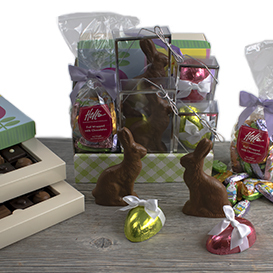 A Two Layer Deluxe Collection box featuring two identical layers of our 16 pieces of our best-selling chocolate, finished with a bright and colorful Easter topper. TWO solid, four ounce Swiss Milk Chocolate Easter Bunnies. A Swiss Milk Chocolate Peanut Gianduia Egg, filled with smooth, creamy peanut butter and covered in our sweet Swiss milk chocolate.